What a beast indeed. But beneath the gnarly, knobby exterior lies a creamy, white flesh with a sweet, nutty flavor that dispels any ugly notions you might have about it. Celeriac, also known as celery root, packs in serious health benefits: It’s high in fiber, potassium, magnesium, and vitamin B6. What’s more, if you’re trying to avoid those dreaded nightshade veggies, you can absolutely use it to replace potatoes in any recipe. 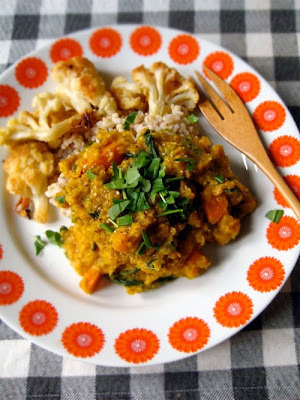 That is precisely how I came up with this next dish, curried lentil stew with celeriac and squash. In Europe this root vegetable’s popularity is akin to carrots, especially in France where they make the famous celerie remoulade by mixing raw celeriac up with mayonnaise, Dijon mustard, and champagne vinegar. Celeriac may be slightly more difficult to find in North American grocery stores, but definitely check as it may be one of those items you simple pass by since it is unfamiliar, not to mention scary looking. Choose medium-sized roots that are firm and free from soft spots or damage. Allow for around ¼ of the weight to be discarded during preparation. Refrigerate in a plastic bag (unsealed). Celery root can keep for 2 or 3 weeks. Trim leaves (if present) and root end. Scrub well and cut off the skin quite thickly to remove any brown bits and the root channels in the base. If you’re using the vegetable raw, place cut pieces in water with a squeeze of lemon juice to prevent discoloration. Serve this stew over brown basmati rice with some roasted cauliflower on the side. I made this dish for some hard-core, meat-loving Danes on the weekend, and they marveled at the delicious, complex flavours, and the surprising satiety factor. Score another one for the vegetarians. 1. Heat oil in a large heavy pot over medium heat and add squash, onion, carrot, celeriac, garlic, ginger, and 1 teaspoon salt, stirring occasionally, until vegetables are softened and beginning to brown, 15 to 20 minutes. 2. Stir in curry powder and crushed chili flakes and cook, stirring frequently, 2 minutes. 3. Add lentils and water and simmer, covered, until lentils are tender, 25 to 40 minutes. Stir in spinach until wilted (or if using frozen, until heated through). Add lemon juice and season with salt and pepper. Garnish with cilantro. Chili flakes and curry should also be avoided if you’re eliminating nightshades from your diet. Yum this was delicious! My first time with celeriac! We loved it, only problem; it made such a massive pot I have no room to store the leftovers ?? Absolutely delicious! We couldn’t find red lentils, so used green ones, and the color is not nearly as attractive as shown in the photo, but still wonderful flavors. Celeriac. Totally underrated, but everyone who I’ve introduced it to loves it. 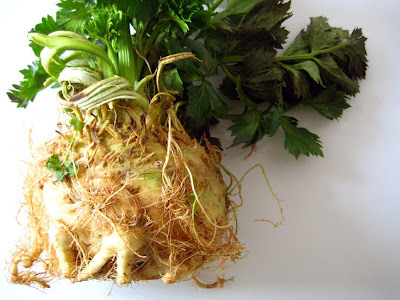 Pingback: Celeriac and Pumpkin Curry | the taste space - steam, bake, boil, shake! Made this with pumpkin instead of squash and enjoyed it. Not as zingy as my typical curries but loved it nonetheless. Thanks for sharing and spreading the celeriac-love, Sarah! This is delicious!!! Thank you for the amazing recipe. Now I have amazing leftovers to look forward to over the next week, too! Celery root is also AMAZING when cooked like mashed potatoes, – or 1/2 celery 1/2 potatoes. One of my absolute favorites! I just made this, it was amazing! that dish looks soo tasty!! !